New London is on the Connecticut Shoreline between New York City and Providence RI (map). The trip from New York City to New London takes about 2-3/4 hours; to Mystic, about 3 hours. Southeastern Area Transit (SEAT) operates bus routes connecting New London, Groton, Niantic, Norwich, and the gambling casinos of Foxwoods and Mohegan Sun. 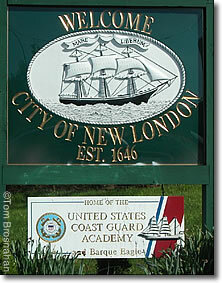 New London is on I-95 and CT Route 52. Rush-hour traffic (8 to 9 am and 4 to 6 pm) in the Groton/New London area is extremely heavy, especially along I-95 and its feeder roads. Make your getaway before 5 pm, or stay and have dinner until the highways are less crowded. Cross Sound Ferry operates ferryboats between New London CT and Orient Point NY, on the tip of Long Island.s North Fork. The ferries run from late May through September.